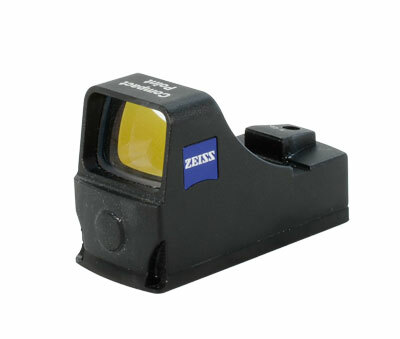 The compact Zeiss Z-Point Red Dot sight is the classic reflex sight for quick aiming. It features automatic intensity regulation for ultra-rapid target acquisition, manual and automatic digital control system to deliver highest security and precision, combination of batteries and solar cell for unlimited usage and reliability, and a sealed housing for added protection. The Zeiss Compact Point Red Dot sight is particularly built for intuitive shooting. The modern reflex sight with a finely controlled illuminated dot helps shoot moving games, even when the field of view is quite low. It facilitates fast aiming and gives the user the advantage of perfect targeting ergonomics. Both the eyes can be kept open while shooting with the Zeiss red dot sight.